Material handling inverters rotate loads through 180 degrees while protecting the integrity of the product. They have a wide variety of applications with products as diverse as molds and dies, stacks of steel blanks, compressor housings and sheets of Corian. Long reach hydraulic scissors for clamping a wide range of load heights. Multi-direction clamping to speed up duty cycles. Programmable logic controllers that automatically sequence loading and unloading to improve productivity and safety. Selectable pressure settings for a wide range of load sizes. Gravity or powered conveyor platforms to integrate into a process line. Hydraulic barrel inverters, named for their circular shape, are suited to production line or high volume operations. 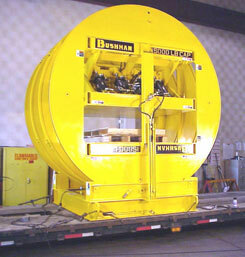 Bushman Equipment, Inc.’s 5,000-pound capacity barrel inverter features open sides for flow-through sheet inversion. Using a forklift, operators can feed sheets up to 88 by 250 inches into the barrel inverter and remove after inverting. 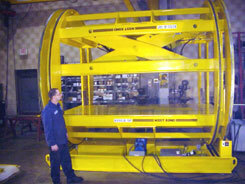 This 15,000-pound capacity hydraulic barrel inverter, designed for an aluminum blanking facility, includes hydraulic clamping. Adjustable clamping pressure is an important product protection feature. 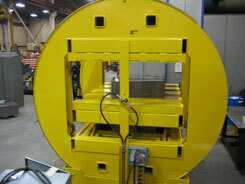 This barrel inverter features powered rollers for conveyor-fed process lines. 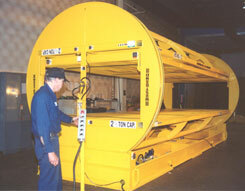 This barrel-style load inverter was designed to invert stacks of aluminum sheets for the automotive industry. The aluminum sheets are inserted and removed from the same side. 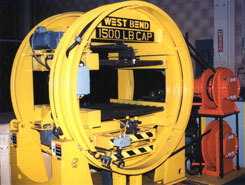 A clamping force of 5 to 1 prevents the stacks from shifting. This custom-engineered 180 degree barrel-frame-inverter has a capacity of 8,000 pounds. 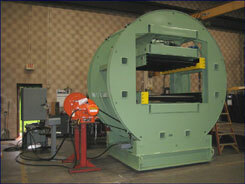 It was designed to rotate steel blanks up to 63 inches square by 19 inches high. 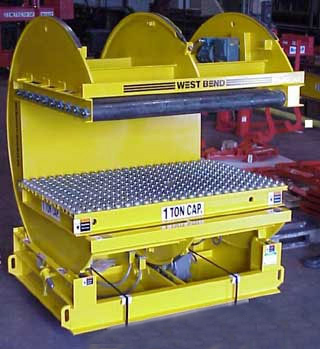 The welded steel inversion cradle is mounted on four machined steel bogey wheels with lubricated roller bearings. Designed with a C-shaped cradle, C-frame inverters can be loaded and unloaded with a forklift or other material handling truck. With optional base rotation, C-frame inverters can be loaded and unloaded from the same side, eliminating extra forklift movements. They can also be customized to suit your application with a wide variety of options. This C-frame inverter with a hydraulic clamp features base rotation for returning loads to the point where they were loaded to eliminate extra forklift movements. 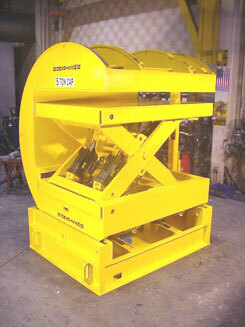 With hydraulic clamping, this C-frame inverter rotates materials quickly and securely. 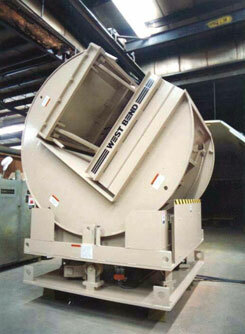 Once inverted, the load moves to a conveyor line automatically. This Bushman Equipment, Inc. C-frame inverter was designed for high capacity, high cycle operations. An industrial gear motor drives rotation on machined wheels that roll on permanently lubricated bearings. C-frame inverters are PLC-controlled so they can easily be integrated into automated process lines.